Maisie Dobbs is one of my favorite fictional detectives. I love her deep compassion and sensitivity, her probing mind and brave spirit, and her struggle to define herself as an independent woman in 1920s and 1930s London. Trained as a nurse and wounded (physically and mentally) by World War I, Maisie sets up her own business as a psychologist and investigator, some years after the war. Her tenth adventure, Leaving Everything Most Loved (out tomorrow), finds her investigating the murders of two Indian women in London, and weighing some big personal questions. An Indian man approaches Maisie about the murder of his sister, Usha Pramal, who came to Britain as a governess and later lived in a hostel with other Indian women, taking cleaning jobs to make ends meet. By all accounts, Usha was a well-educated woman and a radiant spirit, touching everyone she knew with her kindness. Who would kill such a glowing soul, and why? As Maisie seeks to unravel the threads of Usha’s life, another young woman from the hostel is killed. Meanwhile, Maisie worries that the strain of her last case is still affecting her longtime assistant, Billy Beale, and finds herself (still) wondering whether she can commit to marrying James, the man she loves. 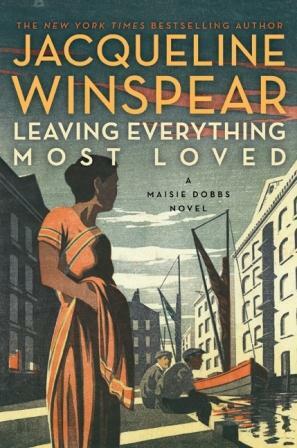 Winspear writes sensitively of Maisie’s inner struggles, with nods to previous cases and Maisie’s personal history, from scullery maid to college student, war nurse to private investigator. Longtime readers of the series will appreciate a subplot or two involving familiar characters, while new readers will warm to Maisie and her thoughtful, incisive method of detecting. Well written, fascinating and layered (like all Winspear’s books), Leaving Everything Most Loved provides both a satisfying mystery and an intriguing new adventure for its heroine. I’m participating in TLC Book Tours’ Month of Maisie Blog Tour. I received a free copy of this book for review; opinions, of course, are my own. I’ll also be reviewing the book for Shelf Awareness. I love Maisie! I only recently finished the second book in the series, so I have a lot to look forward to. It sounds great! I’m on a loooooooong waiting list at the library so it will be a few months before I get this one in my hot little hand, but I can’t wait. I’ve only read the first Maisie book so far but I’m looking forward to continuing!